​The crowd at Modern Woodmen Park groaned. With the bases loaded, two outs in the bottom of the eighth and the Bandits trailing second-place Kane County by three runs, Chuckie Robinson whiffed on a 2-0 fastball right down the middle. “In that situation, you can’t make the moment too big,” Robinson said. Nonetheless, two pitches later, the moment became big. Ahead in the count 3-1, Robinson cracked a grand slam over the left field fence to give the Bandits their first lead of the night, 5-4. Anxious spectators transformed in to 6,404 River Bandits fans roaring their approval. Robinson’s blast proved to be the game-winner in the early June affair. With the win, Robinson and the Bandits stayed within striking distance in the wild card race with the All-Star break approaching. Despite leading the league in transactions in the first half, the Bandits were able to remain competitive in the Western Division with Robinson as a key component. 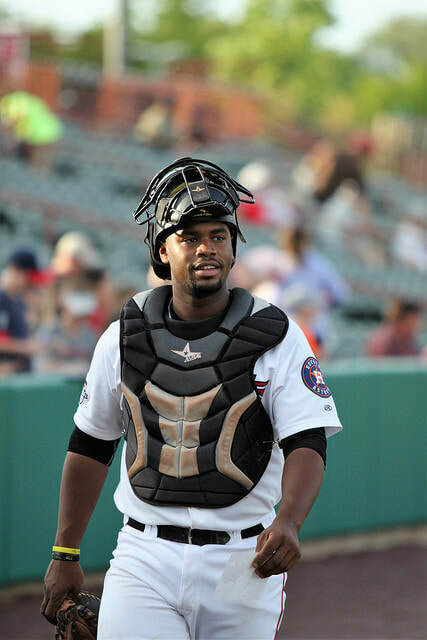 After Jake Rogers was promoted to High-A Buies Creek on May 15th, Robinson took over the everyday catching responsibilities. The 22-year-old’s grand slam has been one of many highlights since taking on his new role. He hit .281 with six homeruns and 34 RBI in the first half of the season. With his late first half surge, he earned a Midwest League All-Star Game nod. The selection allowed Robinson to reunite with two of his biggest heroes. Robinson’s father and grandfather were in attendance in Midland, Michigan to watch the third generation catcher suit up for the West Division All-Stars. The eldest Robinson - Chuckie Sr. - caught for two seasons in the White Sox organization in the early 1960s. The River Bandits’ catcher’s dad – Charles Jr. – was drafted by the Kansas City Royals and also played in the Cubs farm system. When the youngest Robinson was growing up, he recollects his family encouraging him to try any and all sports. Outside of baseball, the Danville, Illinois native dabbled in soccer, basketball and football. However, the allure of following in the footsteps of the previous two generations was too enticing to pass up. “Me and my grandpa, we work with each other a lot. He’s been a big help in improving my game, even until today. In the offseason, that’s who I hit with,” Robinson said. Learning the trade with grandpa, Robinson’s pursuit of a career in baseball has led him across the county. As a sixteen-year-old, the Midwesterner elected to play for a travel team in Atlanta. Playing in tournaments in the southeast, southern colleges expressed interest in the catcher. One of those schools was Southern Mississippi. “I went down there and I fell in love. Obviously the winters aren’t as cold and that was very appealing,” Robinson said. After committing to the Golden Eagles, Robinson turned in three strong seasons in black and gold, capped by a thrilling Conference USA Tournament Championship in 2016. After his junior season, the Astros called Robinson’s name in the 21st round of the MLB Draft. While Robinson had to wait his turn to be the starting River Bandits catcher this season, he is thankful for where the journey has taken him and both of his mentors. "I just want to be in a situation where I am playing pro ball," Robinson said. Robinson is in that situation and he is thriving. While impressing large crowds at Modern Woodmen Park through the first few months of 2017, three generations of Robinsons may soon be ticketed for Buies Creek, Corpus Christi, Fresno and eventually Houston.